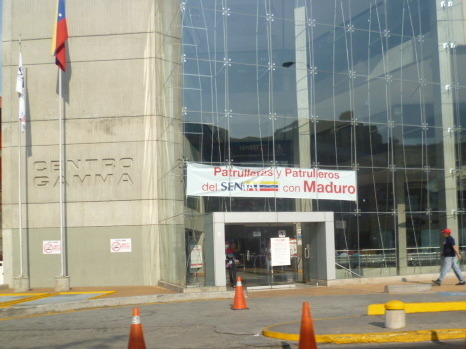 Main office of Venezuelan tax authority SENIAT. Sign over entrance says "Seniat Patrols Support Maduro.“ ”Patrols" are members of the PSUV active in electoral campaigns. In the first post in this series we looked at the advantages of incumbency accruing to the holder of the office of the presidency. In this second post we will look at the advantages of incumbency as they affect candidates’ ability to get their message out and mobilize their supporters. As is widely known Venezuela’s state media is openly and aggressively partisan, with news and opinion programs that provide glowing coverage of the government and excoriate the opposition (see webpage of the Bolivarian Sysetm of Communications and Information). Of course, the government’s significant push into media was spurred by the fact that during the years of serious conflict from 2002 to 2004, private media companies functioned as something similar to political parties. And they have essentially answered the private media’s bias by exceeding it in the other direction. The Carter Center’s media study in 2012 found that the imbalance in the tone of media coverage was strongest in state media (see pp.32-34). In state television outlets, news about Hugo Chavez was 95% positive while it was 22% positive about Henrique Capriles. Private media was 48% positive about Chavez while being 59% positive about Capriles. As was suggested on this blog here in 2012, its impact is often exaggerated as the main state media channel VTV generally has only 5-8% of the market share. However, the situation is complex. The Carter Center’s 2012 report points out that, based on AGB Nielson data,the main state television station’s audience share grew to 24% the week before the October election, putting it second overall, meaning that it could have more impact during elections. Furthermore, the primary private television networks show signs of self-censorship. However it is incorrect to conclude that opposition candidates do not get news coverage. Indeed a media study carried out by the UCAB in the 2012 election showed that Capriles exceeded Chávez in accumulated media coverage (See study on last ten weeks here. See interview with author of the study here). Futhermore, in 2012 Capriles definitely used social media more effectively. Television and radio spots are not a significant element in Venezuelan campaigns as only political parties are allowed to buy spots and these amount to four minutes per radio station per day and five on television. However, Venezuela’s media laws allow the national government to have ten free minutes per station per day to run public service ads. Given the CNE’s restricted definition of electoral propaganda, this means that these ten minutes often end up looking like pro-government “infomericals." Ventajismo is also facilitated by the relatively restricted notion of electoral propaganda as messages that include exhortations to vote for a certain candidate. This definition does not include messages that simply support a particular candidate’s platform or policies. Thus, for example, a full page newspaper ad paid for by a ministry to praise a candidate’s contribution to some policy success in their role as public official is not a campaign ad. This loose definition is most relevant in the use of ”cadenas“–public broadcasts which all radio and television outlets are obliged to carry. In 2012 the CNE ruled that these cadenas were not part of the campaign and did not regulate their content. During the official campaign for the 2012 election (July 1 to October 4) the government broadcast more than 40 hours of information using this figure. Campaigns require mobilization–getting people involved in the campaign, getting them to rallies, and getting them to the polls. And here, as the picture above would suggest, ventajismo is rampant and largely uncontrolled by the CNE. In its 2012 report the OEV criticized the use of public resources "to transport participants to campaign events, hang banners, and put signs in public offices and a long ‘etcetera’ that was readily apparent to everyone.” Indeed, using public resources for campaign mobilization is a tradition in Venezuela and rarely generates comment. As we suggested before and after the 2012 presidential election the PSUV had a serious advantage in mobilization and it is likely to this time around as well. As the Carter Center report points out, using party machinery to get out the vote is not unfair advantage in and of itself, unless it involves use of state institutions. And indeed this was an issue in the 2012 elections. Immediately after the election there were accusations that the government had gained an unfair advantage by engaged in Operación Remate (Operation Clean-up). Of course, there is no problem with a last minute push to get people to the polls. However, there were three concrete accusations regarding unfair advantage. First, there were criticisms that the CNE announce the closing of the electoral centers late in order to allow the PSUV time to bring its voters in. This complaint is a little hard to understand. Venezuelan electoral law is very clear that electoral centers are to stay open as long as there are people in line (See Article 308 of August 2012 resolution). The complaint would have to be that an electoral center stayed open without people in line and that allowed, say, government vehicles with would-be-abstainers to pull up and bring them in to vote. But if that is the case it is hard to imagine how this could have generated the numbers necessary to have a significant impact on the vote tally. Second and more seriously, there were suspicions that the government had information from the CNE on the voter turnout that the opposition did not have access to. In its report the Carter Center pointed out that one of the CNE’s justifications for the Automated Authentication System is precisely to give parties precise information on voter turnout (pp. 45-46). However, at the last minute on the day of the election, the MUD representative was denied access to the room where voter turnout was being tabulated (see p.9). This could have given the PSUV an advantage in pinpointing supporters who had not voted. However, this cannot be confirmed. Finally, there were accusations that the armed forces had been called out to bring people to the polls at the last moment. This accusation was fomented by a set of slides purportedly from the National Guard that was circulating. However, in the days and weeks following the vote, there was a notable lack of evidence of something so conspicuous as military vehicles taking voters to the polls. The OEV detected that in approximately 20% of electoral centers public resources were being used to mobilize voters (see p.21 and 27 in their final report). However, the great majority of these belonged to local governments affiliated with PSUV. About a third belonged to local governments affiliated with the opposition. However, the issue has surged to public attention again in this election, stoked by the declarations of Minister of Defense Diego Molero, in the days after Chávez’s death that “the Armed Forces should be united to get Maduro elected as the next president of all Venezuelans." Such politicization of the armed forces takes on exceptional importance in Venezuela since it is the armed forces that carryout the election and provide security under what is called the Plan Republica. On April 1st, opposition legislator Alfonso Marquina put forward a new document that supposedly showed a plan to use the armed forces for electoral mobilization. This story gained a life of its own and news portal Analisis24 published a piece about a comprehensive plan involving the National Guard, Citizen Militia, and Communal Councils coordinated to mobilize the pro-government vote. The story included dozens of Excel spreadsheets with the names and affiliations of the people involved. However, opposition blogger Francisco Toro spent an afternoon calling a sample of the people but found that there was a clear functional differentiation between people’s roles. The militia members planned to take part in the Plan Republica, but not mobilization. Those who were involved in PSUV mobilization were not part of the Plan Republica. Toro concluded that "Defense Minister Diego Molero’s vow to make Maduro’s victory a mission for the armed foces seems to me more like a bit of posturing (or plain braggadocio) rather than a statement of new policy.” Toro argued that looking at the armed forces was a red herring and attention should be focused on other institutions such as PDVSA.